The BeautyBlender is a small, egg-shaped sponge that is used for applying foundation, tinted moisturiser, BB cream, CC cream and so on. It is designed to provide a flawless finish to your makeup. It comes in three colours; bright pink, black and white. The egg design helps to provide the perfect blend as it is seam-free. The lack of edges means that it doesn’t leave behind any noticeable streaks or lines on the face. The smaller side is also great for reaching into harder to reach areas such as around the nose or under the eyes and for applying concealer, too. It was created by top Hollywood makeup artist Rea Ann Silva and it is made of synthetic materials (but it doesn’t contain latex), is non-allergenic and also odour free. This set also comes with a solid cleanser bar for cleaning the BeautyBlender. To use it, you need to wet the sponge (which is important as it prevents the foundation from absorbing into the sponge, the water acting as a shield - like the video below states) and squeeze out excess water so it is left damp. Next, you need to dab it into your foundation and then stipple (or bounce) it onto the skin. The result is then meant to be flawlessly applied foundation. The shape of the sponge is really easy to hold, which I find important for a tool such as this. It fits easily into your hand and isn’t fiddly, so application of foundation is smooth and simple. The cleanser that was included with my BeautyBlender is the solid version and not the liquid-based one shown in the video above. To use the solid cleanser, you need to wet the BeautyBlender and wipe it across the bar to transfer enough of it to the sponge. Next, you need to massage it thoroughly into the BeautyBlender and rinse it away and let it air dry. Whilst using the BeautyBlender, I found that I had to use a lot less foundation to cover my entire face. However, I also found that then meant that I wasn’t getting as much coverage out of my foundation as I am used to. That is simply remedied though with a second coat of foundation. I then found the coverage to be the same, but a lot smoother. Due to the speed of application with the BeautyBlender, adding two layers of foundation takes the same amount of time, if not still less, than using a brush. When there is a lot of hype about a product, sometimes I find myself raising my expectations too high and then find myself becoming really disappointed. That is not the case with this. It really does live up to the hype! You could barely tell that I was wearing any foundation. There are no lines left behind, no giveaway signs, nothing. Just a flawless application. I still think that the quality of your foundation is just as important, but as long as your foundation ticks all the right boxes (perfect coverage for your preference, the right shade and so on) then this BeautyBlender will definitely get the most out of it for you and more. The cleanser also worked pretty well during cleaning. However, there were a couple of patches that I simply could not get to come out of the sponge using just the BeautyCleanser. Therefore I admit that I did try out something else to try to shift those marks and then they did come out. I am aware that the BeautyCleanser also comes in liquid form, so maybe a future comparison between the two would be a good step. Overall though, the BeautyBlender is pretty amazing. It doesn’t add too much time on to your routine either, which as a mother is pretty important. In fact, I find it faster to use than brushes. The stippling method just blends the foundation much more quickly and with far less effort. The finalising factor that really cements this product as gold-star status for me though is the fact that even my boyfriend noticed the difference. I received my BeautyBlender as part of my September Birchbox. If you are interested in purchasing your own BeautyBlender & Solid BeautyCleanser set, you can grab one for £26 from Birchbox or Beauty Bay (where at the time of posting it is currently on sale to £23.40). Alternatively, you can purchase the BeautyBlender on its own for £16 from Birchbox and Beauty Bay (where again, it is on sale at time of writing down to £14.40). For the accessories, check out the BeautyBlender range pages on Beauty Bay and Birchbox. 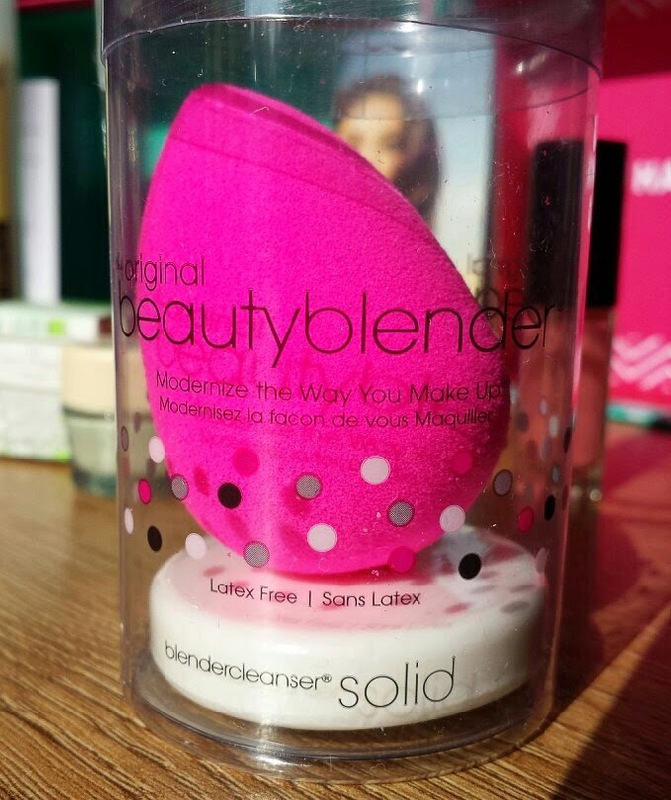 Have you ever tried the BeautyBlender? What is your preferred method of foundation application?